Most high school parabolas these days are either concave up or concave down. I don’t know about anywhere else, but in our school district, any parabola that is not solvable by the quadratic formula is an endangered species. Specifically, I am mourning the loss of parabolas whose directrix is not parallel to the x-axis. The ones that are parallel to the x-axis are such a mundane part of the curriculum that we never discuss the existence of a focus or a directrix. Parabolas can open up in any direction, not just up or down. And they all possess a focus and a directrix. As an example, suppose the focus of the parabola was at the origin, and the directrix was the line , or if you prefer slope-intercept form. This ought to lead to a single parabola as a result: . Parabolas like these cannot be resolved to familiar equations of the form of , largely due to the difficulty in separating from . How do you say this? 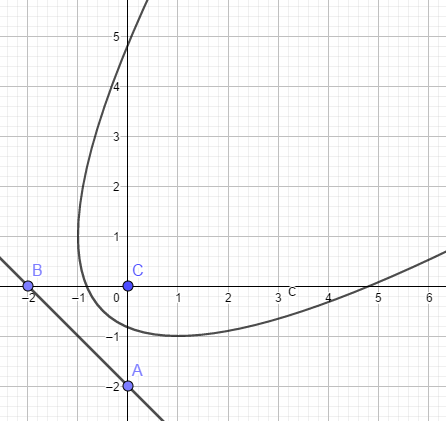 A “non-functioning” parabola? Malfunctioning? I have gotten used to saying to my students that all polynomial functions of have a domain in all real numbers. This works because I am only talking about functions. But for relations like , both domain and range have a restriction. The parabola looks like the illustration to the right. 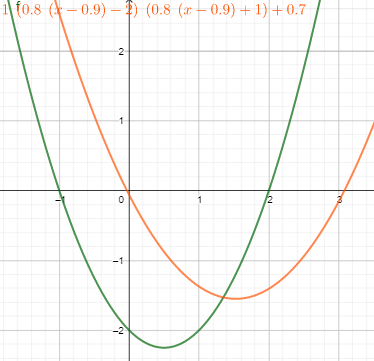 This relation is not a function, because 1) and can’t be separated, and 2) you can pass a vertical line through more than one point on its graph – that is, one value of generates two values of . Other patterns we take for granted are also broken: the vertex is not a local extrema anymore. We require implicit differentiation to obtain the local extrema: , which boils down to . From the point of intersection between this line and the parabola, we find it will have an absolute minimum at . The range, then, is . The vertex is located at . The domain is, similarly, . You raise a good anomaly in math education. Glad you appreciated the message. There are a lot of topics which have been dropped over the past 10 or so years alone. I plan to look at other areas later on. We still cover circles here in Ontario, but not ellipses or certain kinds of hyperbolas.